The wind has not left our sails as we continue on with Rivals of Ixalan Spoilers. A cycle of tutors, a flying pirate with a shrink ray, and Jace overcoming his amnesia are on order for today, let's have a look. Well then. If I remember right, the premier Aggro deck of the format played a one mana 2/1 before rotation just because it was a one mana 2/1. Colour shift it, and give it the potential for flying (which isn't hard for the Vampire deck to do) and this thing is going to see play as the other one drop (other than Legion's Landing) for the Vampire deck. Even the flavour text is a joke towards how pushed it seems! Another key piece shown today might be all the pieces Vampires needs. Having something on the same spot on the curve and mana cost Cast Out or Ixalan's Binding but adds to the tribal synergy overall is very needed in a tribal deck. 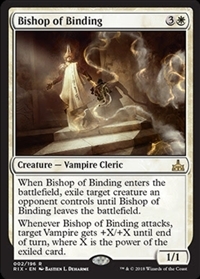 The second line, isn't strictly needed (it's safer to keep this guy out of the red zone) but giving it a +5/+5 (if you've taken a God) may be good enough to attack with. The flavour on this cute little guy is very nice. The baby of the herd dies, then suddenly the rest burst in from your hand and utterly trash whoever killed it. It requires you to hold up the mana for whatever dinosaur you would normally be playing, but having the little guy here be a chump blocker then turning your 5/5 also into a removal spell is very nice in Green. I doubt we'll see this guy in Standard, but I look forward to losing to his trigger in Draft. 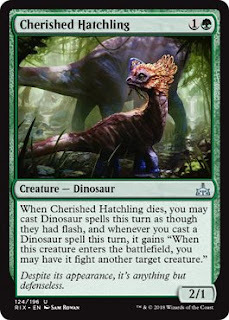 Here's a dino I don't want to see flashed out from Cherished Hatchling's trigger. An eight mana 5/5 is not what you want to see, but being able to make many many 5/5's after it is very strong. 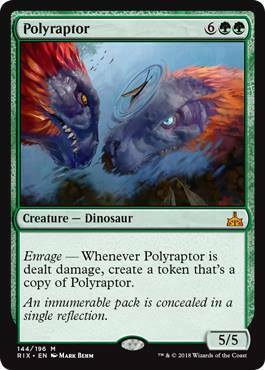 The tokens players that are clamoring for the new Huatli may also want Polly Raptor in their decks too. Maybe I shouldn't mock it, who knows how many there are. The Professor's preview fits his love of the Merfolk tribe, and was accompanied by a great skit co-starring the lovely Ashlen Rose. 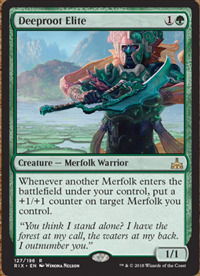 This guy is another sign, alongside Kumena himself, that Merfolk are trying to go as wide as they are tall in the new version of their Tribal deck. What I can hope for going into the set reveal is there's a marked increase in things that make 1/1 Hexproof Merfolk tokens. We need to see the board fill with fish for this guy's trigger to get off the ground and enable something like Herald of Secret Streams. This cycle seems so interesting. Starting off as classic tutors for the tribe they care about - search, reveal, shuffle, put on top - then having an on colour, on tribe trigger for whenever a tribesman enters. 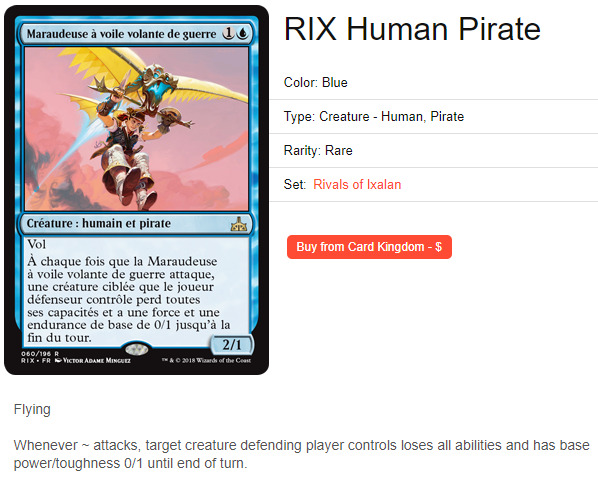 The triggers of most note are those of the pirate and dinosaur forerunners. 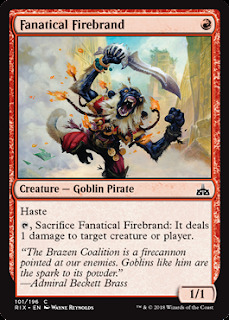 This pirate acts almost as a burn, granting late game reach whenever you make a pirate token with Fathom Fleet Captain. The dinosaur forerunner has the double benefit of being able to ping away the 1/1's of token decks and enrage all your dinosaurs. Powerful flavourful cycle that I hope will be more than a limited payoff. 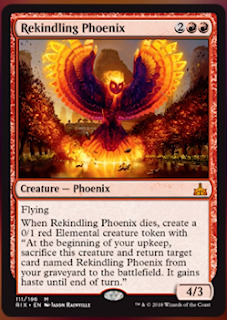 Magic's had a lot of flavourful Phoenixes, and this one may be the most. The elemental it leaves behind represents the ashes, and the fact it comes back with Haste is flavour enough to represent it being pissed about dying and it wanting vengeance with its fiery talons. We think it's called Warsail Marauder, but I can't say for sure. If it's been translated right and I do believe it is (thanks to the guys at MagicSpoiler) then this is mad and has serious Standard potential. Yes a 2/1 is easily killable, but flying is a step to greatness, and that attack trigger means so much. 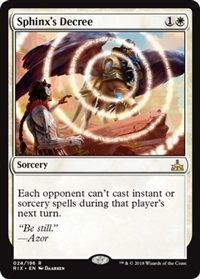 Consider you're playing against four-colour energy, or Blue/Black control and they have The Scarab God. You attack, and turn their Scarab God into a 0/1 with no abilities, then kill it with a removal spell. IT WILL STAY DEAD BECAUSE IT DID NOT HAVE THE DEATH TRIGGER WHEN YOU KILLED IT. 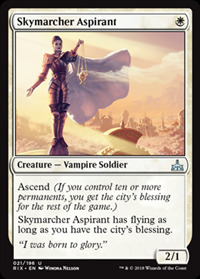 Same with Hazoret, she'll lose Indestructible and become a vulnerable 0/1. Don't forget this card if you're building pirates or even if you're building Favorable Winds. Can they stop printing cards that make storm players (like me) want to explode? This isn't the last time we'll see spell hate today either. I love spells, therefore I love spells that recur spells. Making it a Sorcery and having it exile on resolution is ways of balancing it, but I truly don't see why spell recursion can't be this cheap all the time. I had a very interesting debate with a dear, dear friend about the strength of Instants/Sorceries vs Creatures, and he might be right about Creatures being inherently stronger due to their being a permanent, while the temporary effects of a Sorcery are just that. I personally feel that the impermanence of a Sorcery means it can do more powerful effects than a creature's entry or death trigger at a lower cost. Therefore, there's nothing that says recursion can't be this low. Food for thought. Well, I like Journey to Nowhere. Seeing a version of it back in Standard may make Blue/White Control decks all the stronger (there's another reason for that, keep reading). The downsides are apparent, but also really nicely negligible. Only taking something at CMC 3 or less is not great, but I'm fine taking seven tenths of the most played creatures in all Standard. 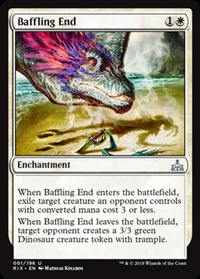 The leaves the battlefield trigger is hardly relevant; no one bothers to spot remove Cast Outs or Ixalan's Bindings, they certainly won't remove this - even if they did, the token would most likely be strictly worse than whatever was exiled. Fantastic removal. So this is a card that exists in common that has haste, and can be cashed in for a free ping. Ramunap Red players get your copies in the Draft Chaff. Seriously?! A flavour win. A card design win. 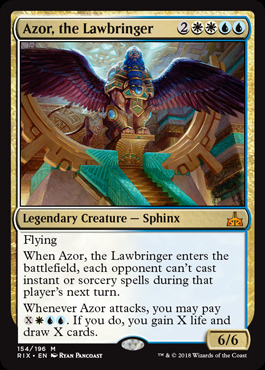 Azor, founder of the Azorious Senate - Ravnica's stuffy government - has come to Ixalan, built the Immortal Sun to trap Planeswalkers, and has since resided over the Golden City in quiet contemplation. The card itself screams Control Finisher to me. One mana cheaper than Approach (the current Blue/White finisher), it ensures no removal spells during their turn, before you can untap with him. His attack trigger is a real revelation (teehee). The spell that used to win games in Esper Control decks of Standard gone by - stapling it to a 6/6 Flying just makes Control look all the more appealing in the new format. I'm in half a mind to cut Red, replace the burn spells with the aforementioned Mysterious End, and have this big boy as a finisher. Sure his Sphinx's Revelation does sink a lot of your mana, but you're playing him by turn 6 anyway, as long as their Glorybringer is dead, you have a 3 turn clock at most. I may be wrong, but Control just made a new best friend in the Azorious Senate. And these are today's newest cards. I must say Rivals of Ixalan is leaving me excited, but overall the bump in tribal support, plus boons to aggro and control, makes Rivals look all the more inviting going through the week.